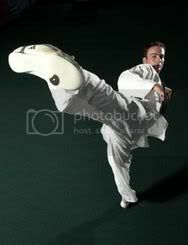 My martial arts training commenced in 1978 with karate as my chosen art. After moving to London from Oxford I attended a variety of different classes training in shukokai, wado ryu, shotokan and kyokushinkai styles. The move up North brought me into contact with my “true” senseis - Nisar Smiler, Dave Macintyre and David Macintyre. I am a member of David Macintyre’s Bukido Kobudo weapons club where my passion for learning is continually stimulated through the expert tuition received and the wide variety of weapons practiced with. I currently run my own Wado Ryu / Shukokai karate class (Sonkei Karate) with a particular emphasis upon the traditional Japanese / Okinawan values of respect and self discipline. As a martial arts instructor I have long been fascinated by the vast difference in how students apply themselves and the very individual learning styles they bring. One question in particular intrigues me and this relates to motivation. Firstly, we can consider the attractions for any given art and secondly (and perhaps more significantly) what holds and engages students with it. Having decided we want to learn a martial art we are greeted by a bewildering array of styles and arts to choose from. It feels like visiting a market place with clubs and instructors touting for business, advertising their wares through a myriad of routes including posters, leaflets, demonstrations, internet sites or even personal doorstep visits! The choice of club to join might also be influenced by geographic location, media influences or some other pertinent factor. Most senior martial artists I know have sampled many different clubs and styles before finding the one that best suits them. For myself, the martial art that first lured me was karate although it took over 10 classes and 4 different styles at locations across the country to finally find the instructors I wanted to train under. In my experience the drop-out rates for those learning karate is significantly high with most leaving after only a handful of lessons. Talking to students about this I learnt that it “just wasn’t for them” or “not what they expected”. What is maybe more surprising concerns those students who appeared to be enjoying their training and then leave after persuading their parents to buy a gi and other expensive training gear. What did they expect though? Many come to the dojo inspired by watching Jackie Chan, the Ninja Turtles or Kung Fu Panda, having witnessed explosive and dynamic techniques, flying kicks and shattering strikes. They might also have played video games, where after a relatively short space of time they find themselves embroiled in combat, warding off multiple attackers. Coming to the dojo there is the hope of emulating their screen heroes and that these skills will be quickly mastered and realised. What they find instead is that learning is slow and that instant gratification is not to be attained. What is it though that facilitates moving beyond this point and setting more realistic achievements for oneself? A starting place might be with the motivational theorists such as Abraham Maslow although it is the point about gratification which is worth exploring further i.e. “What return do I get for all of the time and energy invested”. This is especially salient when the initial enthusiasm and energy start to dwindle and progress seems slow. It is also not helped by the advent of winter nights, a particularly gripping storyline in Eastenders or Champions League football. Anyway, it is worth considering the various internal and external drivers which help to maintain enthusiasm and engagement with continued learning. There may be a process of trial and error with some students or even offering a broad enough “menu” to satisfy the learning styles of the wider group be they reflectors, activists, theorists etc. For some, sparring and pairs work gives a feel of instant application and a testing out of one’s abilities, whilst others prefer to focus upon their techniques through applications such as kata. It is interesting to consider the grading system which awards belts for continued progress and attainment of skills - this is mainly a Western concept/need. I am sure other instructors have witnessed the renewed interest and passion for learning amongst students when a grading is approaching and the enticement of a new coloured belt (especially black) proves motivation enough. Take away the grading system and the number of students remaining would most likely plummet. Ask a number of students what their primary goal is and they will indicate the attainment of a black belt – as if this was the pinnacle, the Holy Grail which would enable a process of self actualisation to occur. I always remember a fable told by an old sensei about two students who were asked why they wanted to join his class. Student A stated that he wanted to get his black belt. He was given a black belt and told he had fulfilled his goal and could now go home. Student B announced that his intention was to learn karate. He was beckoned into the dojo and asked to join training. The lure of the black belt is a powerful motivator although has a major drawback in that having achieved it, the passion for continued learning for a number of students diminishes. Having achieved this notable status symbol the drive to keep working hard and focus upon the minutiae of techniques is simply not there. The problem here is that the main motivating factor lay in an external source and not from within. It is a shame as it is hoped that martial artists appreciate the responsibility that is inherent within the Dan grade of putting something back into the art, namely by helping others learn. This is vital, especially if we want our arts to stay alive – there a number of styles and techniques which have reached the end of their lineage and simply died out, at best preserved in part through writing or diagrams. For me the primary motivational drivers were internal. The award of 1st Dan was merely an occasion to move from the top of one ladder to the bottom of another. The more I learn the more I realise I still have to learn and after 30 years training my appetite remains undiminished. The joints and bones might be creaking a bit now and I can see the kicks getting lower but nonetheless I have a lot more to achieve and pass on. For this reason, it is the core of “switched on” students who I have most time for within my class. I would rather have a smaller class of these students than a large number of ambivalent and unfocused ones. It is the small core group who will after all pass on the learning that we give to them.